For as much as I desperately wanted a radio control system when I was a kid, I never bought an R/C system until I was around 15 years old, when a used 3-channel OS digital proportional system became available from a man that lived a couple blocks away. 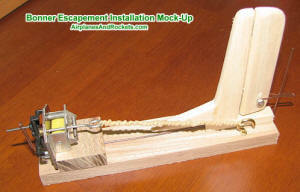 Even the "cheap" $100 rudder-only escapement models were out of reach on my paltry income from a paper route. So, it wasn't until a couple years ago, at age 50, that I finally purchased an escapement from someone on eBay, just to see one up close. 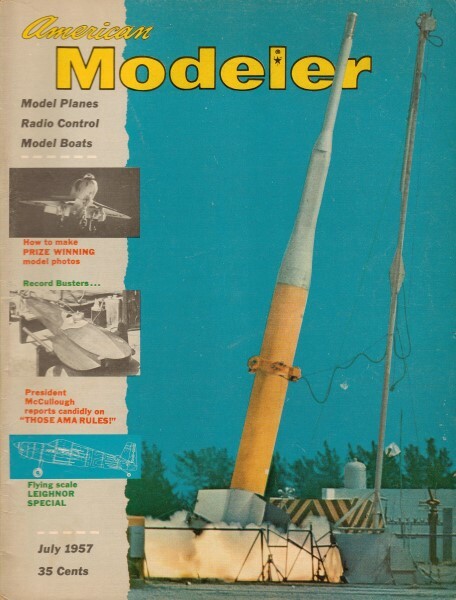 Some of the airplane kits I had, like the Carl Goldberg 1/2A Skylane, showed an escapement installation on the plans, with the rubber band engine and a rather large receiver constructed of discrete transistors and large tuning coils. While looking through the July 1957 issue of American Modeler, I happened across an advertisement for the very escapement that I now own. 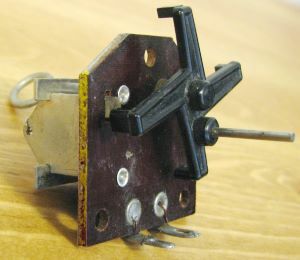 There are no markings on the device - not a manufacturer name or model number. 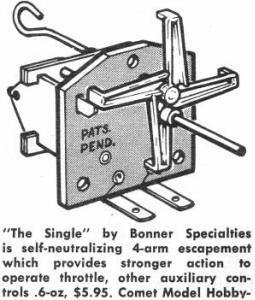 It turns out the escapement is "The Single," from Bonner Specialties. It is a self-neutralizing 4-arm escapement which provides stronger action to operate throttle, other auxiliary controls. Weight: 0.6 ounces. Price: $5.95. I built a mock-up of an escapement installation for controlling the rudder in a single-channel radio controlled airplane, and then made a video to show how it works (see below photos). You can use the U.S. Bureau of Labor Statistics' inflation calculator to see that $5.95 is $46.23 in year 2010 dollars. Here is an article from the January 1955 edition of Popular Electronics titled," 3 and 4 Finger R/C Escapements."